The scrawny lad carried a half dozen rabbit carcasses as he crossed the garden. He spoke to the woman working in the garden and offered, “I’ll trade you one of my rabbits for the daughter you have there.” The woman was Lucy Vernon. The daughter, who was the topic of this conversation, was Lou Rena Vernon, known as Rena, daughter of Simmie Sherman & Lucy Jane Vernon. The lad was Claude House, son of Isaac Arthur and Agnes C. (Brown) House. The setting was Mulberry, Arkansas, about 1911. The newlyweds lived with Claude’s parents for about three months and then moved into their first home, a one room log cabin with a shed attached for the kitchen. Claude had worked as a railroad section crew laborer. He had already accumulated his own farm equipment and team of horses before the marriage. He continued farming and learned the carpentry trade by working with his father-in-law. By the time their first child, Grace Marie House, was born in 1913, Claude and Rena moved to a more traditional house in Mulberry. Isaac Sherman House was born there three years later. About 1919, the family moved to the Peno River Bottom, LeFlore County, near Poteau, Oklahoma. There Claude farmed in partnership with one of his older brothers, Arthur House. A third son, Eugene House, known as Gene, was born there in 1920. The children of Claude and Rena didn’t enjoy a harmonious relationship with Arthur’s children. An incident, said to be typical of their behavior, involved one of Arthur’s children throwing a fork at another at the dinner table. He missed his target and the fork stuck in the bridge of Sherman’s nose. There was a little wooden wagon that was a Christmas gift for two of the boys. They couldn’t come to terms on whose turn it was to play with it, so they just sawed it in half! By this time, a foster child, John Sellers, was making his home with Claude and Rena. John and his siblings were orphans as a result of a flue epidemic. The Sellers family was related to Mary Rice House, wife of Claude’s older brother, Tom. Each of the Sellers was given a home with various House brothers. John Sellers, born February 8, 1906, apparently challenged the parenting skills of Claude and Rena. A story was told about John and Houston House (son of Arthur) pelting one of Claude’s horses with a dozen rotten eggs. Claude made the youngsters wash the smelly goope off the poor animal with their bare hands. John disappeared shortly after the experience. It was learned later that he had joined a traveling circus as a laborer. However, John’s experience with Claude and Rena wasn’t all that bad because he returned as an adult on many occasions to express his gratitude for the home and guidance he received as a youth. Grace and Sherman House started to school during the time the family lived in the ‘bottoms.’ A story about Sherman’s first day of school was told often at family gatherings. Rena took Grace, Sherman and Gene to school one the first day. They rode by horse and buggy. Although Gene was too young for school, he rode along and accompanied his mother during Sherman’s enrollment process. Gene kept repeating, “Sherman’s back there.” Finally, about half way home, Rena got the message. Sherman was, indeed, ‘back there’ hiding in the buggy. It is said, the return trip to school was less pleasant than the first trip. Virginia Mae House, the fourth child of Claude and Rena, was born at Peno Bottom in the fall of 1922. By this time, Rena heard glowing reports from her parents about their life in a little town called, Bixby in Tulsa County, Oklahoma. Claude and Rena decided to join the Vernons. They made the move in December of 1922. Livestock, farm implements, household furnishings and the House brood were loaded on a train for the move to Bixby. A rented place known as the Joe Lowman farm, located at present day 171st Street between Sheridan and Memorial, became the first home for them in the Bixby area. Grace and Sherman could, now, walked the muddy ruts of Memorial Drive for almost two miles to the elementary school in Bixby. After a year on the Lowman place, Claude decided to move to the prairie, three miles west and a quarter mile south of Bixby. Prairie farm land was not as fertile as the bottom land. However, the primary crops of cotton, field corn and kafir corn did reasonably well on the prairie. The land was owned by a man from Georgia named Greenwood. Claude made an agreement with Greenwood to pay grain rent, a portion of the profit from this crop, instead of cash rent. An added bonus to this new prairie life was a country school, known as Central, located less than a quarter mile north of their home. Central educated students from first through eighth grades. In 1925, Claude promised the family he would buy their first automobile if the cotton patch just south of the house produced a certain amount of cotton. The actual number of bales was lost over the years of repeating the story. The children treated this cotton patch like it was their personal garden. Grass and weeds didn’t stand a chance for survival. Water was carried from a pond anytime a stalk of cotton appeared to wilt from drought. Sure enough, after cotton pickin’ season, the family became the proud owners of a brand new Model T Ford. Claude insisted it had to be the open model so that he could load his plow into the back seat for transport to the blacksmith shop in Bixby. Claude received word in February, 1926, that his mother, Agnes, was seriously ill in Mulberry. However, he had not, yet, developed confidence in his driving skills. He enlisted a neighbor boy, Cotton Atkins, to drive him to Mulberry. His mother improved enough for him to feel comfortable about returning to Bixby. He barely completed the trip back when word came that his father, Isaac, had died, February 24, 1926. Agnes lived another sixteen years. Edna Jean House, Claude and Rena’s fifth child was born in the summer of 1926. She was blind at birth. It was soon apparent that she had other health problems, as well. During her pregnancy with Edna Jean, Rena attended a pie supper at Central School. Two grown boys started scuffling. They accidentally knocked Rena to the floor. She always wondered if this incident contributed to Edna Jean’s problems. Edna Jean’s health problems resulted in her death on October 26, 1930. In late 1928, neighbor Ross Rice purchased the Greenwood place. The House family would need to move, soon. Claude rented a farm on the rocky north side of Applegate Hill, just one mile west of Central School. The new location was less than the family was accustomed. The upstairs bedrooms were accessible only by stairs on the outside of the house. That first winter was enough to convince Claude to put his carpentry skills to work and correct the situation by building stairs inside the house. After living at the new location for almost two years, Claude learned that the Rice-Greenwood property agreement had not been successful. Greenwood asked Claude to return to his farm. The family happily moved back. During the 1930s, Sherman and Gene were able to do more of the farm work while Claude did carpentry and masonry work. In addition to homes and barns, he built several businesses in Bixby. Among the latter was Kafer’s Cafe, Ted’s Cafe, Alby & Rook Station, Harry Phillip’s Station, and Roger Plummer’s Station at 161st and Memorial Dr.
By 1934, Claude, started working part time as a roustabout for Pioneer Oil Company. By 1940, he was doing very little farming. Donald Lee House, the sixth child of Claude and Rena, was born during that second occupancy of the Greenwood place. Like his brothers and sisters, he was delivered at home. 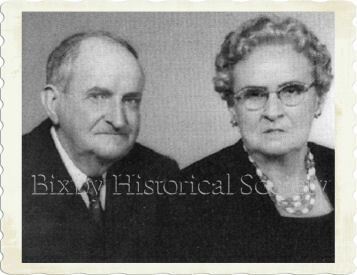 All five surviving children of Claude and Grace completed high school at Bixby. Grace graduated in 1933, Sherman in 1935, Gene in 1938 and Virginia in 1940. Central School consolidated with Bixby Schools and the old school was demolished around 1939. Don started school at Bixby in 1940. He graduated high school in the early 1950’s and headed for college. When Don graduated college, it was the first time in 37 years that Claude and Rena did not have at least one child in school. After Central School was demolished, about 1939, Claude purchased the three acres it had occupied and built a one and a half story rock house with a full basement. The basement walls were constructed of bricks salvaged from the old school. The rocks were hauled by wagon from the hill one mile west. The basement was excavated with a horse drawn slip. Not one power tool was used in the construction of he house. All mortar, even the concrete for the flooring was mixed by hand. Except for occasional help from Rena, sons and sons-in-law, Claude did all the work himself while working five and a half days per week at Pioneer. Although the house did not originally have indoor plumbing and electricity, when they were added, they were constructed by Claude. Don House was the only child to enjoy this new residence. The older children had married and left home before it was occupied in 1942. Grace House married Ted E. Moore, in 1935. Sherman married Lois Jean McClatchey in 1938. Gene married Gladys May Brown in 1940. Virginia married Hurshel R. Miller in 1941. Several years later, Don married Loretta A. Wood in 1959. The House family was active in the First Baptist Church in Bixby. They were also known to attend services at the Applegate Church, a dirt floor, non-denominational country church at the present day 161st and Lewis. An occasional brush arbor revival service in the neighborhood could find them in attendance. Religion was more apparent in the way Claude & Rena lived than in their church affiliation. During World War II, they scarcely attended services. Claude cited gas rationing as his reason for fewer trips to town. However, their attendance did not improve after the war. Claude House never had a car loan or a mortgage. He believed that if you didn’t have the money to pay for something, you did without it. His highest salary was about $250 per month. Granted dollar was worth more in those days, but his first TV, a black and white model, in 1952 cost him about $300. His last two new cars, a 1959 Plymouth and a 1961 Comet were about $1,800 each. Both cars were bare bones transportation . . . not even a radio! He retired from Pioneer Oil in 1958. He had no pension. However, he company provided as much part-time work as Claude wanted. He fished, enjoyed his grandchildren, gardened, did some carpentry work and put a new cedar shingle roof on his house. Claude was a proverbial homebody. However, in 1962 & 1964, he was persuaded to make two trips with Gene & Gladys to visit Don & Loretta who lived in North Carolina. He appeared to enjoy his retirement. However, in the early part of December 1964 he became ill with severe abdominal cramps. Dr. Raymond Daily made a house call and ordered him to the hospital in Broken Arrow for tests. The hospital deemed his illness too serious for the Broken Arrow facility and transferred him to St. Francis Hospital in Tulsa. There he underwent exploratory surgery. A blood clot in the mesenteric artery had blocked circulation to vital organs. The organs had become consumed by gangrene. Claude died on December 7, 1964, before regaining consciousness after the surgery. While her family was growing up, Rena House believed her duties were to take care of her family. However, she did her share of field work and farm chores. Just doing the laundry was an all-day chore. She needed to draw the water by hand from the cistern, chop and carry wood, build a fire under the wash-pot, scrub the clothes on the rub-board using home-made lye soap, rinse and ring the clothing by hand, and hang the them on the line to dry. Ironing clothes required heating the old flat irons on the wood cook stove. Rena ventured out to help in the defense effort during World War II. A fourth of her salary probably went to the car pool driver. She was our Rosie the Riveter at the bomber plant, Douglas Aircraft, in Tulsa. She, also, worked a short time at Barnes-Manley laundry after the war. She enjoyed Claude’s retirement years. Less than a year after his death, she sold the house & three acres. She moved to town to be within walking distance of the grocery store, drugstore, post office and her activities. She had not driven a car since the Model T days. Now she did not want to learn to drive. She enjoyed the Young at Heart Club, quilting and frequent visitations by friends and family. Unlike Claude, Rena was a gadabout. She was ready to go anywhere, anytime. As a widow she made several trips, mostly by bus. However she ventured out by air or auto, driven by anyone who would go, on a few occasions. She traveled to California, North Carolina, Alabama, Arkansas, Kansas, Texas and Nebraska. Her active life came to a halt as a result of a fall on the front steps of her home in August, 1973. She was hospitalized with a broken hip for several days. After that fall, she was never able to live alone and take care of herself, again. Rena lived in a nursing home until August of 1975. At that time she was hospitalized with severe pain in her back. Lou Rena Vernon House died in St. Francis Hospital, Tulsa, Oklahoma, on September 13, 1975. Contributing to the cause of death were kidney failure, congestive heart failure and diabetes. Many more stories could and perhaps should be added to the Chronicles of Claude and Rena House. Stories like a certain mischievous goat and a pig named Julius Stubfuzzel. Gene’s prize winning steer and Sherman’s capons rate should be mentioned. Then there is the story of how the Pretty Boy Floyd shoot-out on the next farm ruined a night’s sleep. Claude’s conversion from Democrate to Republican might surprise some people. Perhaps there’s enough material for a second Chronicle. To protect the privacy of living persons, some birth and marriage information is excluded. Contact the author for more information.